Working together, people can innovate and achieve exceptional results. Today's voice, video, data, wireless networking and mobile technologies can enable extraordinary collaboration -- anywhere, anytime, on any device. ATSG has the skills and experience to meet all of your Collaboration needs. An integral part of unified communications and critical for best collaboration results, IP telephony and unified messaging deliver a flexible, reliable and feature-rich phone and e-mail system. They enable productive communications and faster decision-making, while improving business processes, and maximizing profitability. Integrated audio, video and Web conferencing solutions provide you with a wide range of advanced features to help your remote teams work smarter, faster, and more efficiently. Real-time meetings include face-to-face communications, sharing of content, and high-quality video recordings -- all with the productivity of an in-person experience. Instant messaging applications are fundamental to an efficient communications experience. 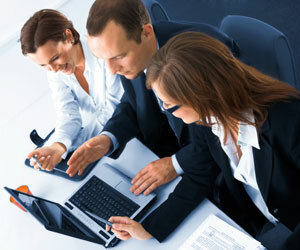 They allow initiation of voice, video and Web collaboration, based upon the known availability of participants. A person's availability or presence is critical to efficient and productive collaboration. Wireless technology has caused the wide adoption of smartphones, tablets, and other mobile devices. Employees now demand Bring-Your-Own-Device (BYOD) environments – with anywhere access to corporate applications. Mobile technology must be selected and implemented with a careful eye to performance, compliance and security of corporate assets. Today's Contact Centers provide a competitive advantage for their companies. It is critical that customers receive prompt, personalized and professional responses to their inquiries. This must be accomplished at low cost in a complex environment. Sophisticated and highly-integrated hardware and software communications tools can get the job done right. Fully integrated IP telephony systems enable data and voice to be transmitted over a single network infrastructure. Enterprise Session Initiation Protocol (SIP) trunks allow the use of industry standard-based protocols to implement and consolidate traditional telecom services -- such as digital PRIs and analog POTS -- into a scalable and robust PSTN redundant solution. With proper placement of border elements and gateways, a highly resilient cost effective telecom solution for the enterprise can be built -- while allowing interoperability between diverse voice systems.